Here's the dough ready for the oven. I like wheat bran for keeping the towel from sticking to the dough. Here's the loaf just dumped out on the 13" stone. This picture is taken through the oven door. Here's the finished loaf. You can just see my new dough scraper propped on the cooling rack behind the bread. It measures the bread at nearly 5" high! The crust is definitely browner than I would like. And last of all, the inside. - I weigh out 430 grams of flour instead of measuring 3 cups. Apparently I was measuring lighter cups than Jim Lahey, as this looks more like bread dough, and not like a think pancake batter! - I use very little flour for the fold and rounding process. Of course this is easier, now that I have the correct amount in there to start with! 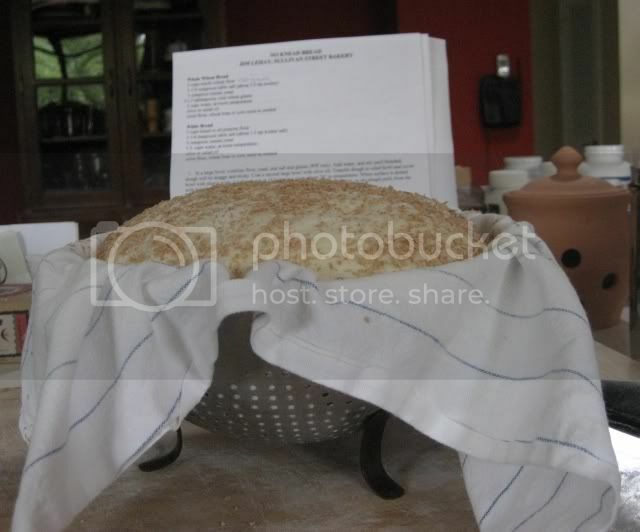 - This is the first loaf I've raised in a colander, instead of on a flat surface. I'm not sure that really made a difference, as the dough was so different by the time I placed it in the colander. 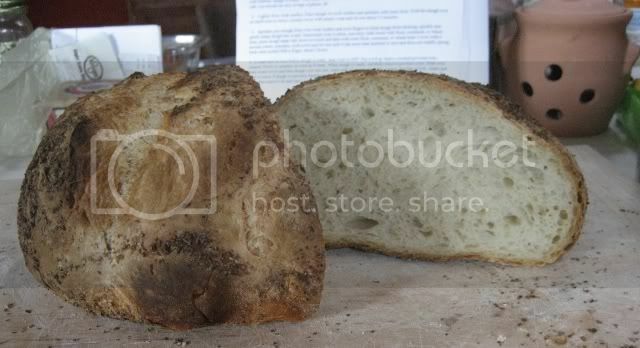 - This was also the first loaf I've baked directly on a stone, instead of in a pot. It's a good thing I decided to do that, because by the time the loaf was ready to go in the oven, it was obvious it wouldn't fit in the 4 quart pot I'd been using. - Since I didn't have time for an 18 hour rise, I started with 90'F water instead of the 70'F I usually use. - It was baked for about 10 minutes less time. I think my oven isn't regulating very well. 10 minutes before time to check the bread, I could smell it burning and took it out of the oven. - Nice crisp crust, (had been a bit tough). 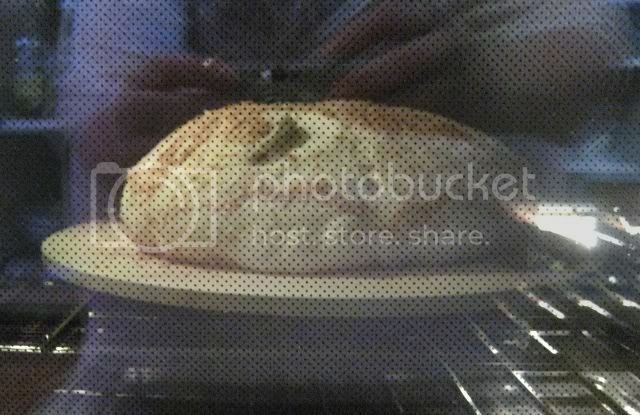 I even heard that nice crackling sound as the crust cracked when I removed it from the oven! 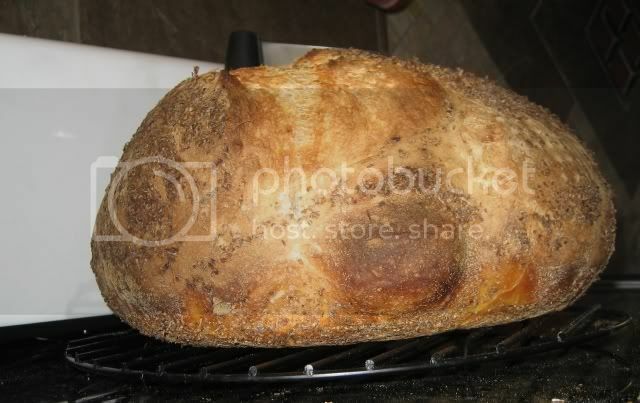 - The flavor was very good, though I'm not sure how the it compared to the last few loaves. We took it to a friend's house for dinner. Between the other food and the conversation, I didn't pay enough attention. I did find out it's surprisingly good with guacamole! The flavor is better than my very first NYT loaves, but even they were incredibly good. This is just a very easy method that also produces a very good loaf of bread. It's also whet my appetite for doing other types of bread. That looks fantastic, kippercat! Unlike you, I wish I could get my crusts more brown. But I haven't ever tried the NYT recipe. Maybe I should try it and just bake it on the stone like you did--I don't really want to risk thermal shock with my family heirloom Le Creusets. Glad it was such a great success! Thanks Katie. As long as it feels like bread dough, I imagine it will bake on the stone just fine. Some of my first batches were so soft they needed the pan to confine the dough! KipperCat, I baked my spelt NK bread - and got a nice burn across the pad of my thumb in the process. I decided to use my stone and the base of my stainless dutch oven so that I could use a higher oven shelf. I lined the banneton with parchment and carefully placed dough and paper on the stone, THEN found out that the dough was risen enough to make placing the cover tricky, hence the burn. Now I wish I had used the ss dutch oven because the dough was very slack and I think the restriction of the pot might have helped, also the lid is domed and the loaf obviously hit the bottom of the dutch oven and might have risen more. I baked it until it was really dark and the cust has crackled nicely.Too warm to cut yet, so I am going to put new batteries in my camera and hopefully get pictures. Onward and upward, A. PS, I pulled the parchment out when I removed the base of the pot. I'm looking for an answer to the tough crust that you mentioned! I've finally made a decent sourdough loaf of NKB, but the crust is just TOO tough for me! (I've made several loaves, both yeasted and sourdough, and they were all this way.) I can hardly chew it. It hurts my teeth! I was expecting it to be crunchy, as everyone was describing, and actually anticipating it, but this chewiness.....I just don't like it. What can I do to make it less chewy? Leave the lid off?